"The social media phenomenon is still ramping up, and this book provides useful and timely business advice." "Social media and customer care are rapidly coming together. 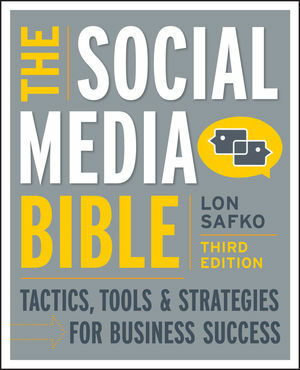 The Social Media Bible is a must-read for any professional who wants to stay on top of this rapidly changing topic. From the basics to long-term social media strategy, this is the only resource book to have on your desk." —Scott Ross, Senior Vice President, Sales and Marketing, NCO Group, INC.
"Lon Safko and The Social Media Bible address the key questions—Why should I take part in social media? How should I take part? How do I reap the greatest benefits?—while also providing the push to take the next step." "Lon Safko is a serial technologist who really understands social media and is also blessed with the gift of being a great communicator. His book deftly takes you from 'Social Media 101' all the way to PhD status in a format that is easy to browse, informative, and powerful." —Tom Asher, Director, Consumer Relations, North America, Levi Strauss & Co.
"Effectively harnessing the power of social media is a top priority in corporate America. The Social Media Bible, with its informative and tactical approach, provides an easy-to-follow road map for how to do social media right." LON SAFKO is a marketing consultant with more than twenty-five years of experience in speaking, marketing, sales, strategic partnering, and e-commerce. He has founded fourteen successful companies, including Paper Models, Inc., holds three U.S. patents for 3D Internet advertising, has eighteen inventions in the Smithsonian Institution, and privately coaches companies on harnessing social media, marketing, and innovative thinking to create higher productivity and profits.